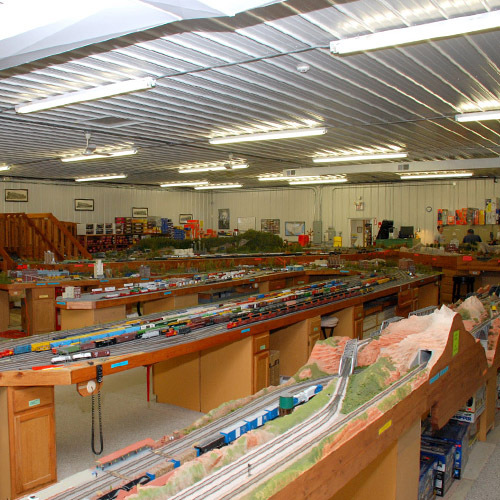 The layout was started in March of 1998, in a 60' x 81' room located next to a hobby shop inside a warehouse. The purpose of the layout is to demonstrate new products and techniques. 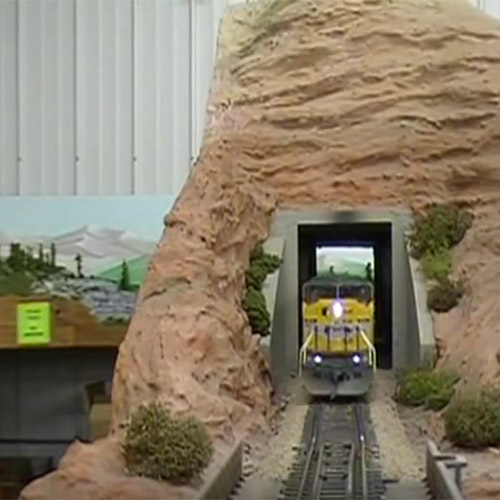 The layout room includes a dispatcher and observation platform that is handicapped accessible. The layout includes three major railroads (ATSF, UP & SP) that all interchange with each other, two short lines, and five major industries. The ATSF includes a 255' double track main line and a 19 track yard with an average storage track length of 23'. Each main line loop has 9 blocks with each block having its own throttle. Four operators control both loops while radio controlled throttles are used for the East end yard, West end yard, North local, South local, oil refinery, and both short lines (2' x 55'). The UP and SP loops are usually combined into a 550' single track loop and use digital command control. The UP operation includes a nine track yard with an average storage track length of 14'. The UP also includes a steel mill, ore mine, and coal mine. The SP operation includes a 15 track yard with an average storage track length of 19'. The SP also serves a large back-in station, an ore dock, and a paper mill. All three major railroads have an intermodal yard, fruit growers express warehouse, numerous grain elevators, and an interchange track/yard with both of the other railroads. 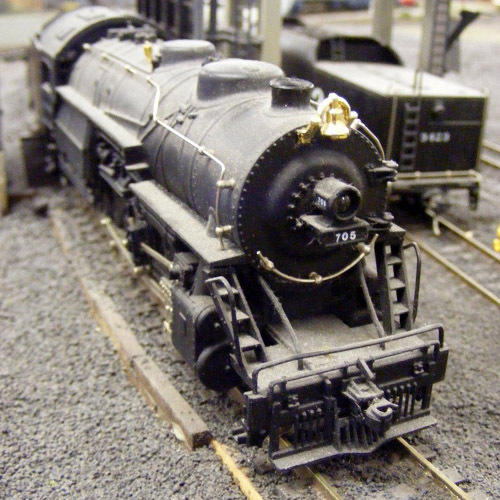 Since the UP and SP are single track main lines with passing sidings, dispatchers are necessary and give instructions via radio to engineers with radio controlled DCC throttles. The engineers are responsible for the operation of their train and positioning of the 415 manual turnouts while the dispatcher is only responsible for proposed train movement and has no switches or buttons on his panel in the balcony until future track signals are installed. Other features include 110' of hand painted backdrop, both screen wire and Styrofoam scenery, many commercially available buildings doubled or tripled in size, and unique bench work held up by 107 kitchen cabinets. Since the layout is so large, many unusual methods were employed to make trees, create a seamless backdrop, and eliminate shadows. Also on site is a 6' x 7' O gauge demonstration layout with K-Line, MTH, and Lionel command control.